While the West teeters on the edge of recession, Asia is booming. China has expanded and now serves virtually every major country in the world. India is catching up by servicing its own population and dominating in a few industries. Both countries are now actively acquiring companies in Europe and America. Smart businesses in the West are moving into Asia to take advantage of the growth there. Many multi-national companies owe their healthy financial picture to the growth in Asia rather than America or Europe. 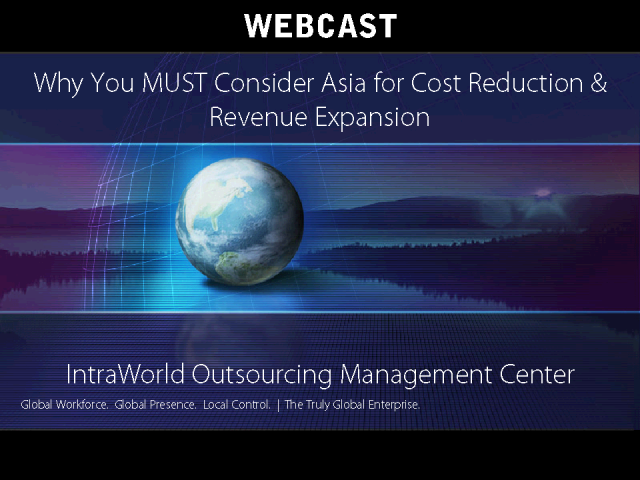 The purpose of this webcast is to show you: 1) Why India and China MUST rise; 2) What is happening in Asia today; 3) Why Western countries (and companies) MUST take note; and 4) Three powerful strategies to use India and China to increase your profits while securing your future against upcoming competition.